These are the supplies I bring on one of my marathon grocery shopping excursions. Multiple canvas or re-used paper grocery bags, for bringing home the booty. Re-used plastic food tubs, best for bulk liquids like oils and syrups. 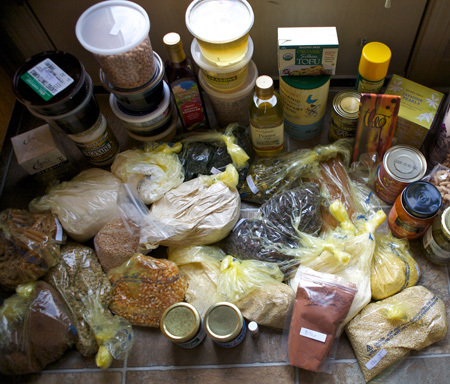 Many many re-used plastic produce baggies, for dried goods like rice, beans, and baking flours. Also, you know, for produce. 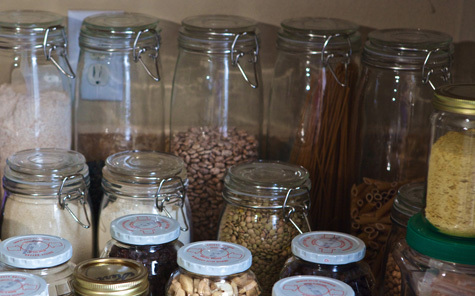 Glass jars, because there’s never enough containers . . .
And this is what it looks like when I get it all home – you can see why labeling is so important! Now, I could just stop there, throw the dried goods in the cupboard and the perishables in the fridge, and call it a day. But of course, I’m much too meticulous for that sort of haphazard attitude! In my kitchen, everything has a home. I use retro glass canisters to store my flours, beans, and pastas, displayed on my kitchen counter (back and second row). The rest are stashed away out of sight. I use old apple sauce jars (they’re perfect!) for all my fruits, seeds, and nuts; of course they have to match because I’m crazy like that, and it also helps them to stack easily. The rest are random jars for random stuff, like the bran that lives in the fridge and the Nooch that hangs on the seasoning shelf. 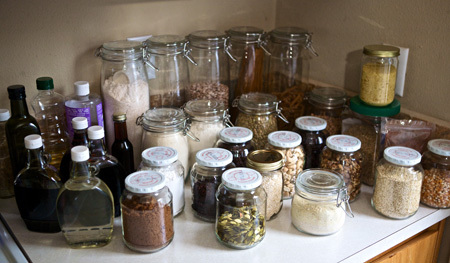 I saved a bunch of syrup bottles from my last Master Cleanse (far left) and they’re great for holding tamari, agave, molasses, etc. Sometimes I keep the original jug and just keep refilling it, like the big brown rice bin (on the right with the green lid) and the olive oil, canola oil, and castile soap bottles (back row left), all of which I now buy in bulk. Organization is key, at least for me. And just for posterity’s sake, this is what my whole haul looked like. That’s about $160 worth of groceries, and quite a few big-ticket items like nuts, fancy oils and vinegar, those amazing local Thai curry pastes that go for $5 a pop, etc. But, working in tandem with my produce method, this will last us quite a few months. All things considered, it’s incredibly thrifty. But most importantly, eating like this – whole foods, real foods, made-from-scratch plant-based meals – is the healthiest thing you can do for yourself. And SO YUM! I love using old jars. Many of mine are mismatched, but I do have several quart sized ones that I get local honey in (the honey guy takes them for recycling for $1 off another jar of honey, but so far I haven’t saved more than I can use). So sad about closing co-op! @ Kelly – Aw, thanks! I seriously think you must read my mind or something. It’s amazing… due to several life changing events (at least temporarily), we are seriously restricting our budget and keeping track of every nickel and dime. I’m just now pinning down everything, and was like, ok, loose ends – i.e. food, i.e. non produce groceries. Hmmm… I should make a list for like a monthly run… boy sure would be nice to have a reference… oh yeah Sayward’s post! Ha. When I’m about to run out of flour, I go buy flour… at least that’s how I’ve always done it. Now I’m going to have to do it your way… and your list does help as a point of reference. I’m horrible about remembering grocery items until I need them. I totally appreciate you sharing your experiences with us – it helps those of us who are still honing our mad skills yo. How do places deal with your glass jars and other stuff they normally wouldn’t provide? 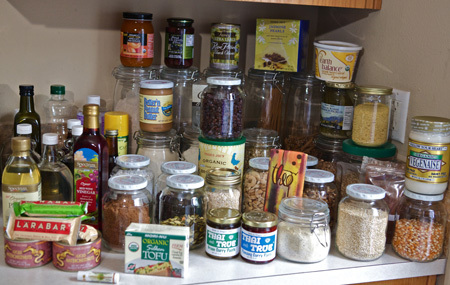 I really want to start buying bulk when I can and love the idea of using my own containers instead of theirs. I’m trying to reduce the amount of plastic I use and I have glass jars to use. I’m just wary of going into Whole Foods with them. I should probably just ask, shouldn’t I? @ Courtney Osborne – I know plenty of people who take their glass into Whole Foods! I’m sure they’ll be quite accommodating. All you need to do is put a piece of masking tape on each jar, and bring a pen with you. Then, you just weigh each jar (or have them do it for you if the scale is behind the counter) and write the ‘empty weigh’ on the masking tape. Then you fill it up, and they’ll re-weigh it at check out and subtract the ‘empty weight’. It’s totally doable, and waaaay better than plastic. Luck! I’m still catching up on previous readings and was really impressed by your shopping method and the reusing you do. I don’t have a sewing machine but so I purchased ready-made, reusable bags for shopping. 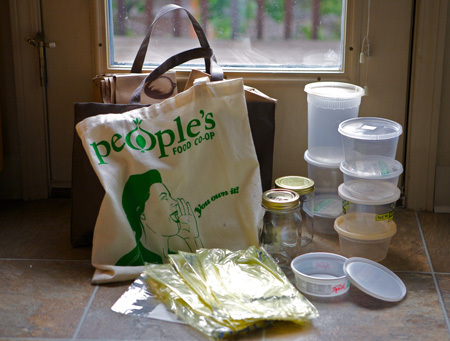 I have reusable grocery bags, produce bags, bulk bags and found reusable baggies with zippers that are great. The website Etsy has an endless supply of great handmade items and is great for gleaning ideas. @ Nona – Hi, welcome to the site! I’m so glad you like what I’m doing here, and I totally agree – Etsy is AWESOME for all sorts of eco friendly supplies. It’s great that you’re making the changes. Oh!!! I love seeing other people with glass jar obsessions. I have rows of canning jars filled with nuts and oats and seeds that drive my husband slightly crazy, but I love being able to see what I have.